We sometimes roast 3 chickens at once and make broth from the skin and bones. We eat fresh roasted chicken as one meal then make lots of chicken sandwiches and burritos, etc. We make a big soup or other dish from the remaining chicken. 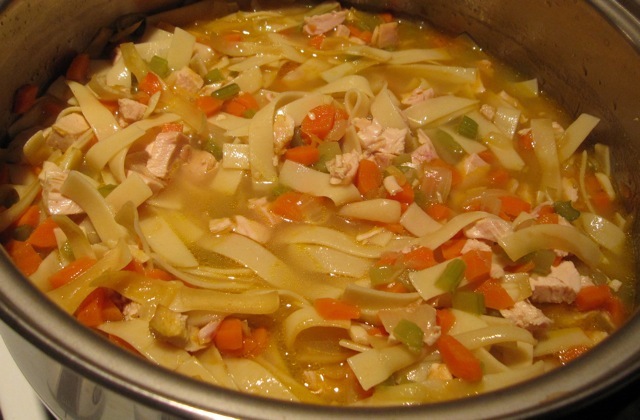 One thing that is fun and easy to make is chicken noodle soup. And so delicious. Quantities are approximate. There is lots of room for adjustment! In large skillet, saute onions and carrots in the oil till carrots just start to get tender. Add the celery and garlic. Cook all till carrots and celery are tender. While the above is cooking, bring broth to boil and add noodles. Cook till noodles are barely done. Add onion mixture to broth/noodle mixture. Stir well. Add more broth if you'd like it to be soupier. Stir in juice of 1/2 lemon (or more). Serve with lemon wedges. Extra lemon really does improve the flavor (but everyone may not agree).